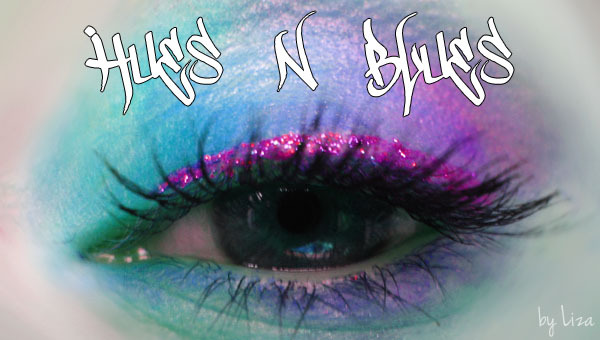 HyperSmash Hues N Blues: More Hi Fi Cosmetics Swatches! I bought full size eyeshadows in Top 40, Another Day Another Drama, So What, and Suicide Trees and was sent free samples of Yuletide Carols and Three Libras. SO WHAT is an amazing, cool pink with tons of blue-violet iridescent shimmer! ANOTHER DAY, ANOTHER DRAMA is a vibrant purple with ultra-fine cosmetic grade holo glitter and tons of pink and fuschia sparkle! TOP 40 is a deep hot pink jam-packed with LOADS of fuschia sparkle!!! SUICIDE TREES is a deep, metallic teal on an opaque black base! As beautiful as it is dark and ominous! DARK STAR CAPRICORN is a dark, warm plum shade that is absolutely loaded with gorgeous pink sparkle! THREE LIBRAS is a cool, pale, shimmering beige with lots of iridescent sparklies! YULETIDE CAROLS is a rich, robust brown loaded with black-gold glitter! My faves are So What and Suicide Trees. So What is a nice colour to wear on it's own as a daytime colour when you want something light but pretty. Suicide Trees would be gorgeous in a smoky eye look. Hi Fi is available from etsy or artfire on facebook. I always like your swatches, they are very accurate. Thanks! Aww thank you! Ah cool, it's an awesome name!